From what I’ve been able to tell from listening to the “comic geeks” at the local comic shop, you either really like the Legion of Super Heroes, or you couldn’t care less. Crazy super-powered kids from the future saving the galaxy and messing with Superman’s time line. My 13 year old daughter happens to be in the “really likes” category, in fact she’s obsessed with them. She’s been gobbling up every back-issue she can get her mitts on and can talk Legion history with the older guys (the majority of Legion fans would be men in the 40’s and 50’s). She’s known about the 4 exclusive JLU-style Legion figures (Saturn Girl, Cosmic Boy, Lightning Lad and Brainiac 5) coming out on MattyCollector.com for some time now and has been reminding me often that I’ll need to be online on May 15th to order them as soon as they go on sale. What cracked me up this morning (May 15th) is that I woke up to a house filled with reminder notes that she has placed about before heading off to school. On my night stand, on the refrigerator, by the coffee pot, on my computer desk… Pretty much anywhere she knew I’d be today. Not sure how fast they’ll go, so if you want them, better go get them! 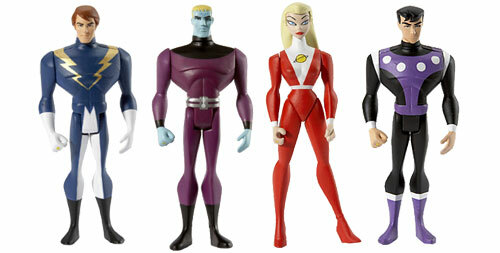 Tagged Action Figures, Brainiac 5, Cosmic Boy, JLU, Legion of Super Heroes, Lightning Lad, mattel, Saturn Girl. Bookmark the permalink. Dude. I’m 14. Not 13. lol. LEGION ROCKS PEOPLES!!! heh. kid after my own heart. isn’t this what post it notes are for??? ?